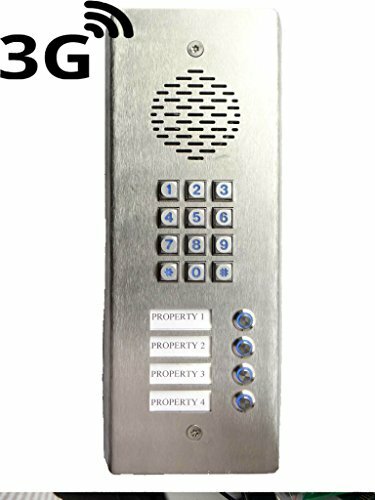 The 3G GSM Gate Intercom incorporates a professional industrial grade GSM engine that receives calls at its SIM number, as any ordinary GSM phone. The system operates in the GSM module Quad-band and 3G 850/900/1800/1900/2100Mhz, this Intercom works with both 2G and 3G Simcards. When a visitor arrives at your property they will press the call button on the intercom which will then connect to a phone number (up to 2 numbers can be added which will be rung in sequence) of your choosing, once you answer the phone and speak to them you can then open the gate from your phone and let them in remotely from wherever you are in the world. You can also open the gates by dialing the simcard number held within the unit and also by pressing a combination of your choice on the keypad. The unit is housed in a brushed stainless steel vandal proof box, with a high quality backlit keypad and call button - it is a high end GSM intercom at an amazing price and all manufactured here in our factory in Shoreham, England The unit is easily wired into your gate and garage systems and the box is small and durable and can easily be stored outside and is perfectly weathered (IP65 rating) box which means it is perfectly weathered for outside installation and has been tested in high heat and freezing weather conditions, we are so confident in the products durability that we now offer a 2 year product warranty and will replace any faulty models in that timescale.